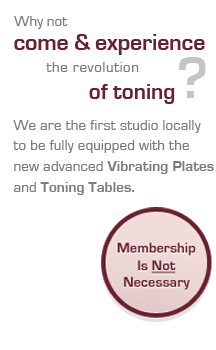 Myself (Amanda) and Jacqui offer one2one personal training throughout your toning experience we believe you will get the very best results from your time with us. This is because although our equipment is easy to use, our experience in helping people with their various conditions and ailments over the years has left us with unique insights into how to get the best out of each piece of equipment. Furthermore, if you are looking to improve your body shape, remove toxins, reduce cellulite or increase muscle strength we have some great methods and routines to guide you to your goals!